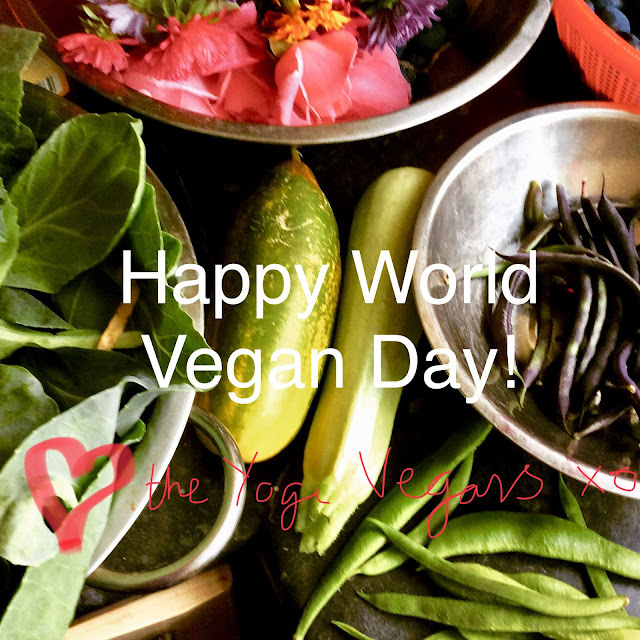 Happy World Vegan Day 2018! A fitting day, I think, to resume blogging after yet another lengthy break.. and how the world has changed since we last wrote here! It’s now mainstream knowledge that we are in the sixth world mass extinction event, and the first to have its cause attributed to humans. Global warming, pollution, landfill, deforestation, air pollution, factory farming... all these and doubtless more are factors which have led to the sorry state this planet is in. But whereas once species like bees die out humans too are history, our Earth planet will recover in time, greening and cleansing herself, without bother from humans. Personally, I’d like to be there to see things turn around so I’m doing my level best to leave as small a footprint as I can. A big part of this is being vegan. On the positive side, veganism all over the world has never been more popular, and - the ex- editor of a certain UK supermarket’s magazine notwithstanding- people everywhere are understanding that being vegan is not just a diet but a total paradigm shift: a journey in consciousness towards a kinder, more equitable way of life for all living things with whom we share this beautiful planet. Vegan options in food shops and restaurants are increasing all the time, vegan food events like markets and fayres are going on in so many towns and cities globally, and eco-friendly businesses are cropping up everywhere. Making changes can start small; I have acquaintances who gave up dairy, then, meat, then became veggie/ vegan over a period of months or even years. Over the last few months we have ditched plastic bottles for drinks and haircare products, and choose only cotton buds that are plastic-free. As our consciousness eveloves we choose to adopt more environmentally- friendly habits until we truly do embody a more compassionate and thoughtful lifestyle. One of my favourite quotes (spoken by Gandhi) is “Be the change that you wish to see in this world.” Once enough people are doing this as individuals, then the world will indeed change for the better. If you are vegan, why not celebrate this start to Vegan Month by wowing your non- vegan friends and cooking up one of the recipes on here (or choose from the many sites and books available). Or if you are not yet vegan, have a go and take the seven-day vegan challenge and se how much better you feel! There are so many places you can go for support: https://www.vegansociety.com/ Is a good start. Tell us all about your vegan experiences in the comments!